Apr. 05, 2019, 2:30 p.m.
“If a superhero can’t save his family, then he’s not much of a superhero,” Billy Batson resolutely proclaims before shouting into the heavens above the Delaware River. Summoning thunderous crackles and electric sparks boisterous enough to awe Ben Franklin, the mischievous foster kid transforms into his alter ego. The Seven Deadly Sins have been given life and unleashed into Philadelphia — and Batson is determined to save the city. So goes the plot of Shazam!, Warner Brothers’ latest cinematic addition to the DC Universe. When the trailer came out last summer, I was skeptical. First, because of the sheer audacity of yet another superhero franchise (how many of these are we supposed to follow? ), and second, by the story’s setting in, of all places, Philly. This location didn’t come from the original comic book; it seemed gratuitously chosen by the film’s creators. But despite a couple of minor geographic and transportation fumbles (peep that SEPTA train in the trailer), this is not a movie that deserves local sneers. The refreshingly endearing flick displays love and optimism for Philadelphia, in both aesthetics and plot. And the story’s overarching messages — that families are chosen, and that not all loving families look the same — fit perfectly in this diverse and resilient city. Note: We will try our best not to spoil the film, but we’re sorry if any surprises sneak in. In the movie, Batson (Asher Angel) and his red-and-gold spandex adult alter ego (Zachary Levi) — who carries the “Wisdom of Solomon, Strength of Hercules, Stamina of Atlas, Power of Zeus, Courage of Achilles, Speed of Mercury” — are joined onscreen by Batson’s foster family and their own older and stronger manifestations. Their antics at home, school, and zooming around the Comcast Technology Center’s zipper are set against a backdrop that — in spite of the film being predominantly filmed in Toronto — retains authenticity while still showing the city in a positive light. The impressive aerial shots throughout the movie (attributed to Philly By Air, LLC in the credits) show a cosmopolitan city with a sleek look, but it’s still definitely Philly. There are glittery nightscapes of Market Street, but there’s also Shazam soaring off the tip of PAFA’s iconic paintbrush. Visually, there’s some grit interspersed here and there, but Filthadelphia mostly remains in the shadows. Along with the plethora of DCU Easter eggs (anyone catch that frayed Ace Chemicals logo at the fictitious Pennsport warehouse/training ground?) 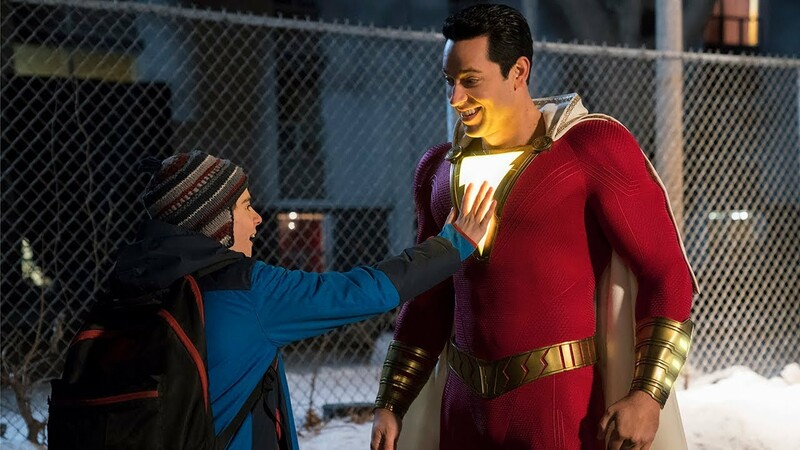 and allusions to Shazam!‘s bizarre origins and legal battles with Marvel Comics, there are plenty of Philly-themed Easter eggs sprinkled throughout the movie. These Philly symbols don’t just make their way onto the screen, but are incorporated in meaningful ways that serve the overall plot. Kudos to director David Sandberg, producer Peter Safran, and screenwriter Henry Gayden. As far as crimes that could happen in the real Philadelphia — so not those perpetrated by the movie’s supervillan, Doctor Thaddeus Bogog Sivana — there is a shooting. 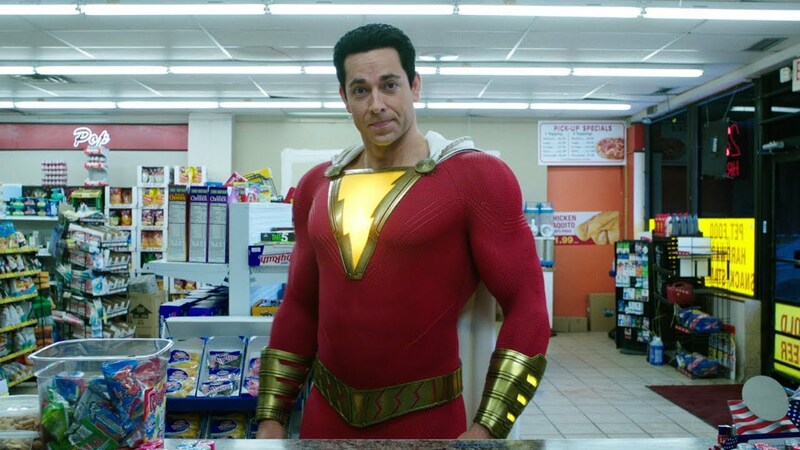 It happens when Shazam is trying to cop a beer at a bottle shop, which also sells Tastykakes. Though the corner store gets shot up, the scene is still about family: Batson was trying to score a beer for himself and his BFF brother-slash-superhero manager, Freddy Freeman (Jack Dylan Grazer). The family theme runs throughout. In a city as diverse as Philadelphia, it was delightful to see Victor and Rosa Vasquez — Latino foster parents — provide a warm, secure home for their rag-tag underdog team of foster kids: Billy Batson, Freddy Freeman, Mary Bromfield, Eugene Choi, Pedro Peña, and Darla Dudley, three of which are people of color, one who is disabled and another who is queer. Their teamwork and devotion for one another, in spite of their differences, makes them strong against the forces of evil. Shazam! is the superhero flick that this city deserves.